Come and experience a relaxing vacation at a wonderful little lakeside “Kozy Kottage” situated just 25 feet from the water. Our guests will have access to a private dock in a quiet cove. You will enjoy an entire right side of the dock, lounging chairs, a patio table. There is an available lift for a single PWC, other watercraft can be tied to the side of the dock during your stay. The water toys include a slide, diving board, paddle boat, canoe and a large watermat. Several life jackets will also be provided. It’s the most conveniently located vacation rental at the Lake! Located on mile marker 17.2 on the Osage, in the “Old Ski Show” cove. It is less than 1 mile off Osage Beach Parkway off MO-54 – minutes from the Outlet Mall, Wal-Mart, Dierbergs, Hy-Vee and many of Osage Beach’s popular restaurants and night-life. It is close to many of the lake's fun stops like Dog Days, Short Pants and RedHead Yacht Club by water or by car, Backwater Jack’s is the next cove over. The view from inside the cottage and the large deck is spectacular!! It has a nice living area with full kitchen stocked with plates, utensils, pots and pans, full sized appliances and small appliances such as toaster, blender and a microwave. It can sleep up to 4 with 2 bedrooms - one with a queen bed the other with a bunk bed. All bed linens and bath towels will be provided. The spacious outdoor deck is in the shade of two monster oak trees. It includes a beautiful view of the Lake, patio tables, several chairs and a gas grill for cookouts. “Kozy Kottage” is perfect for a family getaway to enjoy a fun time at the Lake of the Ozarks!!! My name is Karen. I'm a native to the Lake of the Ozarks having lived here since the age of 5. My family was lucky enough to live right on the lake minutes away from Ha Ha Tonka (which is now a state park). The five of us kids got to swim, ski, fish and golf every day. I feel very blessed spending my childhood is such a beautiful area. My husband Craig and I know the lake area very well and we are avid golfers. 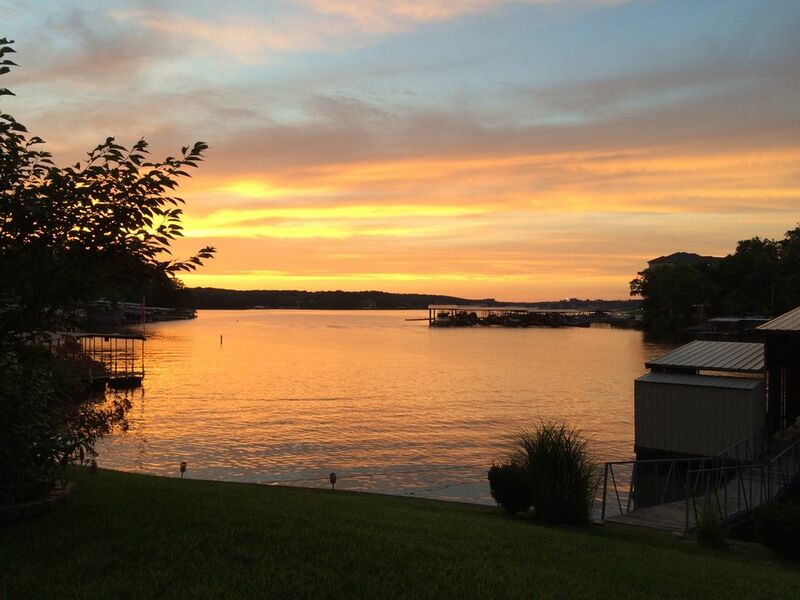 We can help you make your stay at the Lake of the Ozarks a memorable one. It's located on quiet cove which is perfect to swim, fish, canoe and sunbath. The dock has a diving board, slide, paddle boat, and canoe. A slip for one PWC will be available for you to use. The porch spans the entire from of cottage with tables and lounge chairs to relax. In the evening you can grill out and enjoy the spectacular sunset in full view. Has a very small walkway to the shower. But the shower tub is normal size. Decorative only - No Fires! Covered parking spot uphill from the cottage. One additional vehicle may park at the top of the driveway. Shaded deck just a few feet from the seawall. Spectacular sunset/sunrise view of the Lake. Great dock. Loved the views from the deck. House was very clean and easy to find. Close proximity to many things to do. Enjoyed our visit very much. Loved my weekend away. A welcome note to the Kottage was unexpected but lovely! Wonderful sunrise and sunsets! Very comfortable, owners on site make things easy. They are very responsive. I needed a hairdryer and it was delivered very quickly. Friendly people everywhere in Osage Beach, many choices for restaurants and shopping very close! A great little place to celebrate our 15th anniversary. Beautiful view of the lake. Off the beaten path but still close to everything. My wife and I enjoyed a few days of relaxation and quiet time. This place is all about those things. The fish were biting and the evening air was great. I would recommend this place if you want to just get away from everything. Thanks for an enjoyable time. Exactly as listed. Beautiful place, the amenities available did not disappoint. Gorgeous views. This little cottage had it all. Views, water access, water toys, comfy spaces indoors and out. We didn’t need anything , Karen was available for any questions, very kind and welcoming host. This home away from home was the perfect place for our weekend.